Summer is salad season! With loads of fresh herbs, crunchy vegetables and a lively lemon dressing, tabouli (tabbouleh) is perfect all summer long. 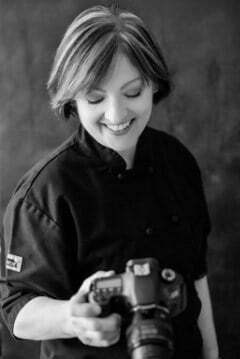 My version has fresh jalapeno for a spicy kick! 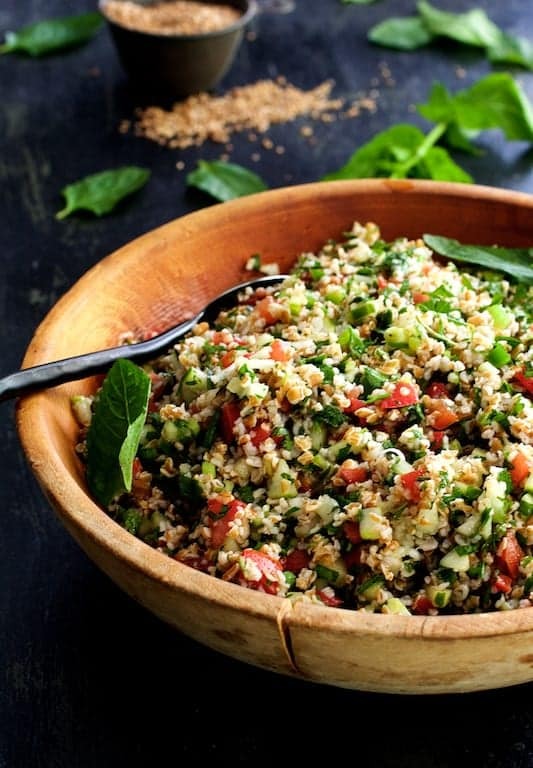 Tabouli (or tabbouleh) is generally served on Romaine lettuce leaves as part of a Middle Eastern appetizer course known as mezze (or meze) with things like hummus, baba ganoush, olives, yogurt, etc. There are numerous variations to this classic dish. The flavors in this tabouli are as bright as the Mediterranean sun with fresh parsley, fresh mint, lemon, garlic and fresh vegetables in the way of cucumber and tomato. Fresh jalapenos add a spicy kick! Bulgur wheat is a form of cracked dried wheat. 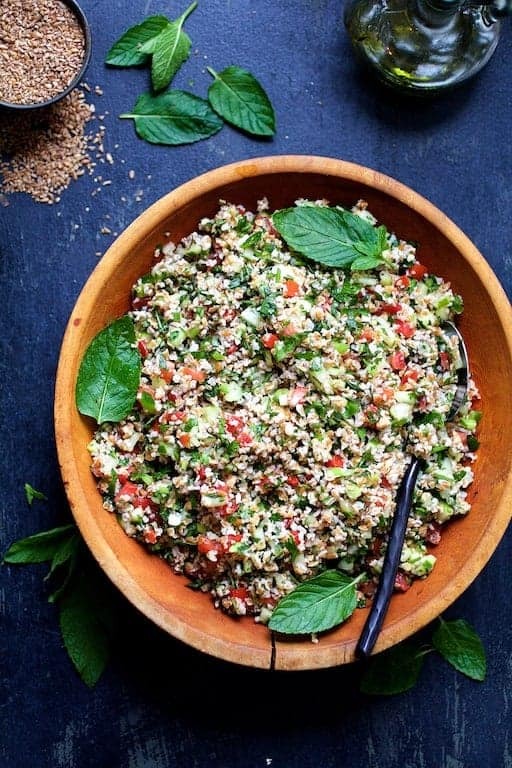 The bulgur wheat which is standard in tabouli can be replaced by quinoa or brown rice to make it gluten-free and by cauliflower to make it Paleo-friendly. 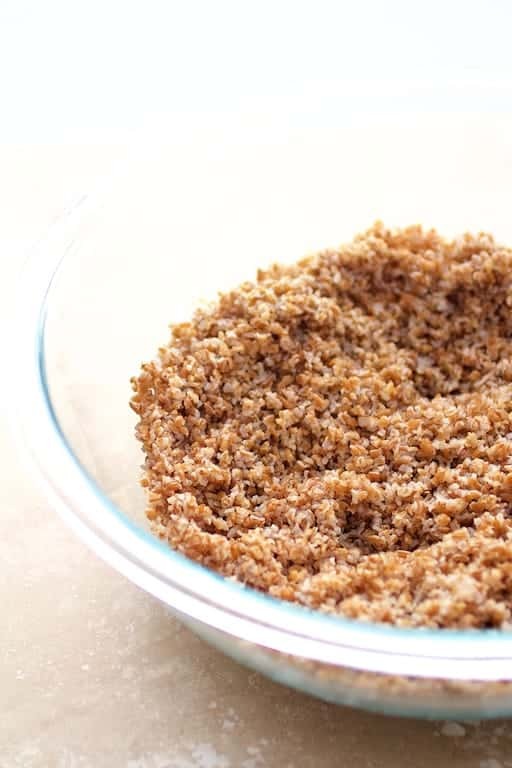 Whereas things like quinoa and brown rice take some finesse to cook, all you need to do with bulgur is add it to salted boiling water, cover and let it sit until the water is absorbed and it has softened up. Tabouli has been requested by my clients a number of times recently, so I’ve had plenty of opportunities to play around with the ratio of boiling water to bulgur. 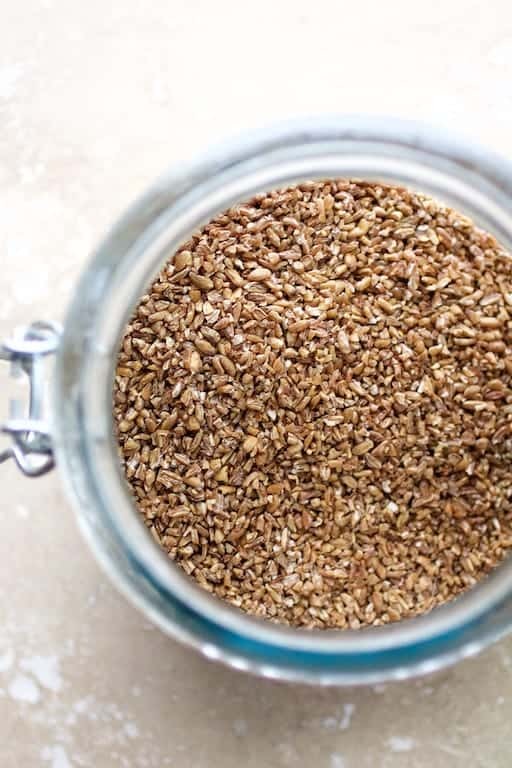 The first time I made it, I followed the ratio on the package of Bob’s Red Mill bulgur (one cup boiling water to one cup bulgur) however, the bulgur did not soften completely. Another time, I tried 1 1/2 cups boiling water to 1 cup bulgur but still had water at the bottom of the pan so I had to drain the bulgur thoroughly in a sieve. So…. you guessed it! 1 1/4 cups of boiling water worked just right. However, I actually start with 1 1/3 cups water in the saucepan then bring to a rolling boil. As the water is coming to a boil, some of the water is going to turn to steam so you’ll end up with approximately 1 1/4 cups. Add salt, the bulgur, give it a quick stir, turn off the heat, cover and let stand for 45 minutes to 1 hour. Then, transfer it to a bowl to finish cooling while you’re prepping the herbs and vegetables. My hubby and I like things on the spicy side and fresh jalapeno really makes this tabouli sing! I started with one jalapeno which was a nice, gentle heat but two jalapenos really rock it! As always, adjust the amount of heat to YOUR taste and be careful handling fresh jalapenos. Wear gloves if need be and don’t touch your eyes or anything else important. If you don’t wear gloves, be sure to wash your hands thoroughly after handling. I like tabouli a little wetter and pretty lemony, so there too, adjust to your taste. If you plan to serve the tabouli at a later time, leave the dressing off. Summer is salad season! With loads of fresh herbs, crunchy vegetables and a lively lemon dressing, tabouli (tabbouleh) is perfect all summer long. This version has fresh jalapeno for a spicy kick! Bring 1 1/3 cups water to a boil in a saucepan. Add the salt and bulgur wheat and stir. Remove from the heat, cover and let stand 45 minutes to 1 hour. Transfer to a bowl and let cool thoroughly. Add the tomatoes, jalapeno peppers, cucumber, scallions, parsley, mint and garlic and stir. Whisk together the lemon juice and olive oil. Drizzle over the salad and stir. Season to taste with salt and black pepper. Add additional lemon juice if desired. To make ahead, prepare up to the point of adding the dressing. Refrigerate the salad and dressing. Add dressing when ready to serve.